Electrum is an extension to the Alloy Analyzer by INESC TEC (the Institute for Systems and Computer Engineering, Technology and Science) and ONERA (the French aerospace research center) provides an analyzer for Electrum models, a temporal extension to the Alloy modeling language. The Analyzer provides both bounded and unbounded model checking procedures. Alloy is a simple structural modeling language based on first-order logic developed at the Software Design Group. Its Analyzer can generate instances of invariants, simulate the execution of operations, and check user-specified properties of a model. The best way to get started with Electrum is to download the executable jar (see Running) and follow the tutorial. You can also watch the following video for an overview. A repository of examples with familiar Alloy examples converted into Electrum is also available here. To perform analyses on an unbounded time horizon, one needs to have installed Electrod program, as well as NuSMV or nuXmv. The Electrum Analyzer requires Java 8 and can be built using Maven. The script will also build Kodkod/Pardinus. Run the Maven script to generate a self containable executable under electrum/target. This will compile Electrum and Pardinus, and pack the available native libraries. An extension of Electrum, with actions, is currently under study. Check out the paper with the preliminary proposition. If you wish to build it, repeat the steps above, just replacing -b master in the first line by -b actions. Electrum is open-source and available under the MIT license, as is the Alloy Analyzer. However, it utilizes several third-party packages whose code may be distributed under a different license (see the various LICENSE files in the distribution for details), including Kodod and its extension Pardinus, and the underlying solvers (SAT4J, MiniSat, Glucose/Syrup, (P)Lingeling, Yices, zChaff, CryptoMiniSat and Electrod. CUP and JFlex are also used to generate the parser. J. Brunel, D. Chemouil, A. Cunha and N. Macedo. 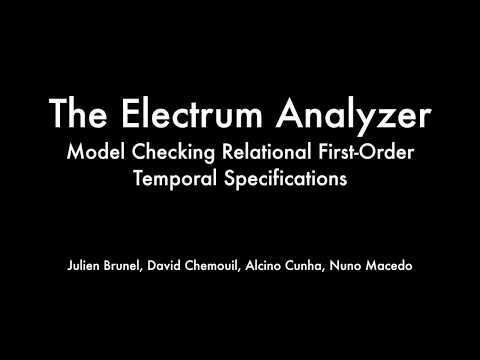 The Electrum Analyzer: Model checking relational first-order temporal specifications. In the proceedings ASE’18. ACM, 2018. A. Cunha and N. Macedo. Validating the Hybrid ERTMS/ETCS Level 3 concept with Electrum. In the proceedings of ABZ’18. LNCS 10817. Springer, 2018. J. Brunel, D. Chemouil, A. Cunha, T. Hujsa, N. Macedo and J. Tawa. Proposition of an action layer for Electrum. In the proceedings of ABZ’18. LNCS 10817. Springer, 2018. N. Macedo, A. Cunha and E. Pessoa. Exploiting partial knowledge for efficient model analysis. In the proceedings of ATVA’17. LNCS 10482. Springer, 2017. N. Macedo, J. Brunel, D. Chemouil, A. Cunha and D. Kuperberg. Lightweight specification and analysis of dynamic systems with rich configurations. In the proceedings of FSE’16. ACM, 2016. N. Macedo, A. Cunha and T. Guimarães. Exploring scenario exploration. In the proceedings of FASE’15. LNCS 9033. Springer, 2015. A. Cunha, N. Macedo and T. Guimarães. Target oriented relational model finding. In the proceedings of FASE’14. LNCS 8411. Springer, 2014. Electrum is maintained by haslab. This page was generated by GitHub Pages.